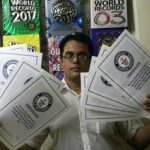 Watermelon World Records - What About Watermelon? Most of us are familiar with records such as the tallest and smallest in the world although who would have guessed you could hold a record for a watermelon related achievement? 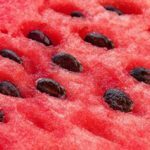 In this article you will find some of the most impressive watermelon related achievements to date. A watermelon weighing 350.5 lb or 159 kg, was titled the heaviest watermelon on the 4th October 2013. 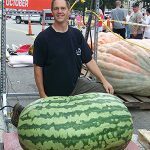 This enormous watermelon was grown by Christopher Kent in Tennessee, USA and was awarded at the Hamilton Operation Pumpkin festival in 2013. The owner of this watermelon quoted: “I always liked growing, even as a kid I had a green thumb. I love watermelons and they grow good in the South. It’s a great honor. Not many people can say they have held a record!”. In Beijing, China one plant sprouted 131 enormous watermelons. Each of the individual watermelons weighed approximately 22 pounds (10 kilograms). This watermelon plant was created by the Zhengzhou Research Seedling Technology Co and was only grown for 90 days. The plant was fed with fertilizer and was placed in a temperature controlled environment which resulted in the mass production of watermelons. On the 25th of October 2017, Dinesh Shivnath Upadhyaya from India ate 367.8 grams of watermelon in just 30 seconds. This record replaced his previous attempt where he ate 332.2 grams of watermelon in April 2017. In 23 minutes, 7.08 seconds, Sam Stilson from Canada was able to eat a 15 pound watermelon. Sam used only his hands to break open and eat the larger than average watermelon. This record was set on the 5th of September, 2009. An unusual record was awarded to Tafzi Ahmed for the most watermelon crushed purely with someone’s head. Ahmed’s rock hard head was able to smash open 43 watermelons in one minute. This record was achieved in 2011 at the Rose Festival held in Germany. In just 14.65 seconds, Olga Liashchuk was able to crush three watermelons with the powerful of her thighs. Each watermelon exploding one after another. This record was achieved in 2014 in Milan, Italy on air of “Lo Show Dei Record”. Olga wishes one day to be titled the world’s strongest woman. This record was awarded to a martial artist named Jimmy Kharadi who allowed multiple watermelons to be chopped in half on his bare stomach. 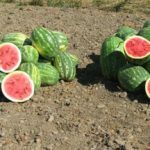 The watermelons were chopped by Vispi Baji Kasad who used a 30-inch katana to slice 49 watermelons on his friends stomach. They were awarded with the Guinness World Record for the most watermelons chopped on the stomach in one minute. No injury was inflicted during this record although Kasad quoted: “The danger is always there in all such stunts, especially when there’s a Japanese katana in the picture which can cut skin very easily, but because of the practice and confidence of Vispi Kasad, the pain can be offset”. The pair of martial artists are hoping to win ten world records for their country. An unsual record that involved Ashrita Furman lying on a bed of nails while his friend Bipin Larkin sliced whole watermelon on his stomach. The thrill-seeking pair were able to slice 14 melons in total although a fair amount of pain was inflicted in the process. This record was achieved in New York, USA during 2016 shared to the public via a Facebook live broadcast. 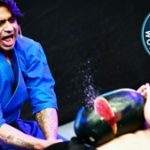 Awarded to Ronald Sarchian on the 29th July, 2017 was the world record for the most watermelons smashed with one punch in a minute. Ronald, from the Unite States was able to punch 76 individual watermelons at the California Watermelon Festival. His attempt in smashing these watermelons was to raise money for the ‘Make a Wish Foundation’. Ronald Sarchian was awarded another world record when he karate chopped 42 watermelons in one minute. This record was achieved on the 5th September, 2017 in New York. Four previous records have been set by Ronald. On the 28th June, 2017 Matt Jones was awarded the record of the fastest time to dice a watermelon. Matt diced an entire watermelon in 18.19 seconds on the set of ‘The F Word’ in California, USA. In just over 18 seconds he was able to dice the watermelon into 90 cubes. 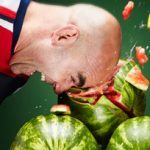 Leonardo D’andrea from Beijing, China crushed 10 watermelons in just 16 seconds purely using his head. This record was achieved on the set of ‘Zheng Da Zong Yi – Guinness World Records Special’ on the 17th December, 2006. 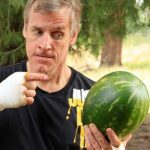 During April, 2011 Brian Pankey from the United States threw a playing card into a watermelon from eight feet away. 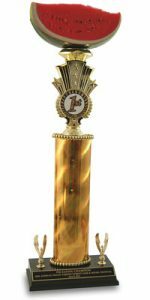 Awarded to Jason Schayot from the United States was the award for spitting the furthest watermelon seed. The seed Jason spat landed just over 75 feet from him which is almost the size of an Olympic swimming pool. This record was set in 1995 and has not been challenged since. Junguk Lee in just one minute threw a total of 12 small paper aircraft’s into watermelons on the 8th January, 2016. From South Korea, Junguk achieved this record on the set of the ‘CCTV – Guinness World Record Special’. In preparation for this event, he made over 50 small aircraft’s that take around 6 minutes each to make. 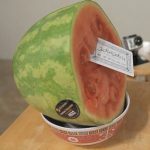 WEEK FOUR WATERMELON PRIZE: A WATERMELON NAPKIN AND PLATE HOLDER!